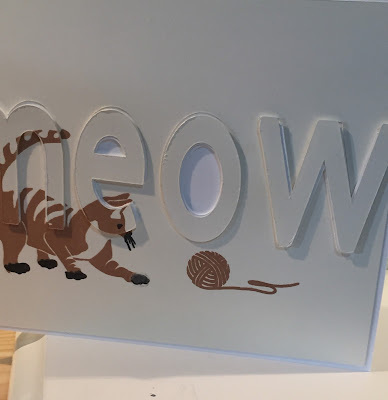 A few weeks ago while hopping through Altenew's blog I saw a video by Jennifer McGuire on three ways to use alphabet dies featuring the Modern Cats stamp set. When I saw what she did with it, I knew I had to have that set! Fast forward to last week when I had the time to try my hand at her awesome card design. One disadvantage I had was that I do not (yet) own the alphabet die set she used, but I had a plan: my Cricut Explore Air. Fast forward to at least one extra day of fiddling with the Cricut, after which I finally figured out how to size, space, and cut the letters "meow." I cut three sets of each like Jennifer did, to glue together for the letters to stand out, with the expectation that the final, top set would be cut from the stamped cat. Two sets, actually, because like Jennifer, I was going to make one card in ivory with the cat and letters stamped on white, and one card in white with the cat and letters stamped on ivory. Excitedly, I stamped my cats on both white and ivory then rolled them into the Cricut for cutting. As I positioned each letter onto their respective stacked letters, however, I noticed a revolting development: they didn't match up. After back-tracking through each step of my CASE process I realized that the sizes of the white and ivory papers used for the stamping were different. Well, I kind of knew that but I didn't think it would make much difference. It did. Of course it did. A couple millimeters kept the stamped images from lining up on the right letters. Maybe I'll try Jennifer's exact design again, but in the meantime, I went ahead and used the letters on matching rather than contrasting cardstock You know, it's such a great design I think it still looks cool!